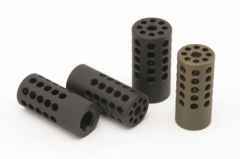 Tactical Solution's compensators are designed to effectively reduce muzzle jump and recoil. They are made from 6061-T6 aluminum alloy bar stock and are anodized in Matte Black or Matte O.D. Green. The compensators are designed fit Tactical Solution's threaded end PAC-LITE barrels with 1/2"-28 thread pattern.